The last few days have made me realize something – it’s probably a good thing I normally have to study all day. In the last 4 days, which I self proclaimed my vacation before I start studying for the boards, I think I have gone to the grocery store 6 times, Bed, Bath and Beyond twice, and the mall once. Despite the fact that I meant for this to be a relaxing break, I created numerous little projects for myself, and then convinced myself that they absolutely HAD to be done. 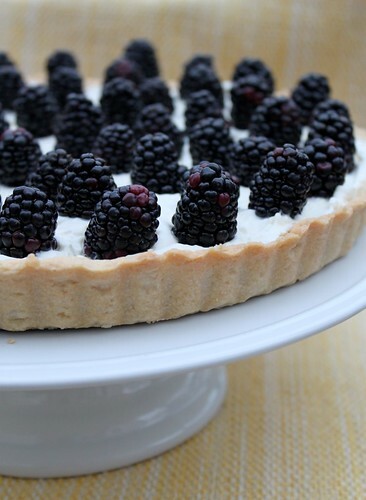 Things like making this blackberry lemon tart, from scratch. (One of the trips to bed bath and beyond was to buy a tart pan, which I clearly HAD to have to make this). But I’m not complaining, because it was all a lot of fun. For the last day before we lock ourselves away to start seriously studying, our friends had a little dinner party. At first I really wanted to make cupcakes to bring, but when I saw blackberries at the store, I changed my game plan, and searched for the perfect spring time dessert that would use blackberries. Like I’ve said before, normally I’m a sucker for a chocolate dessert. I still can never see myself ordering strawberry ice cream when there’s a chocolate chip on the menu – but making a super chocholately dessert didn’t really seem to go with the nice weather, and I know a lot of our friends actually like fruit-filled desserts. I also happen to be a sucker for marscapone cheese, so I knew I would like this. If you’re worried about making your own tart crust – don’t be! It was a lot easier than I thought, and as much as I try to convince myself that store bought crust is just as good, this recipe proved me wrong. This is a great spring time dessert, and it actually quite easy to put together. The only part that requires baking is the crust, which can be made ahead of time. Just assemble right before serving so that the blueberries don’t bleed onto the filling. In a small bowl, mix the egg yolk, vanilla extract and ice cold water. Keep cold. 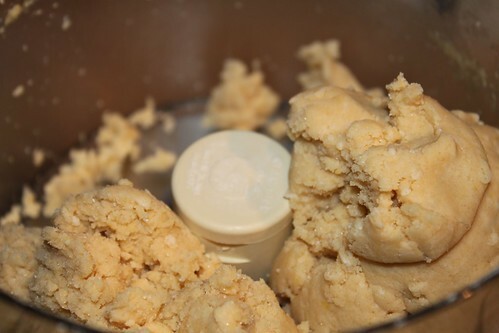 Add the butter to the food processor and pulse until a fine meal is formed. Then add the egg mixture, and pulse until dough just begins to come together. Form dough into a ball, wrap in plastic wrap and refrigerate for 30 minutes. 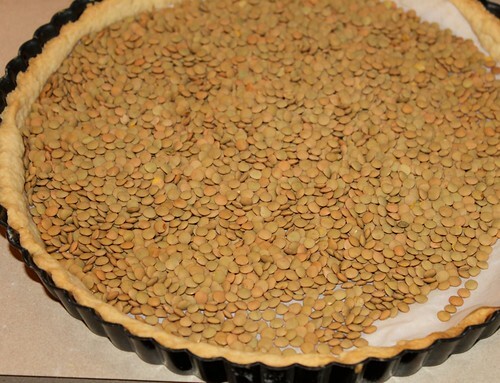 When ready to bake, place foil on top of the dough, and fill with pie weights (which can be beans, peas, rice, etc.). NOTE: I used parchment paper on top of my dough, but did not bring the paper up around the tart edges. This causes the edges to fall slightly when baking so next time I will use foil, and cover the entire surface, so that the pie weights reach all the way around to the edges of the tarte, helping to support the structure. Bake at 350 for 15-20 minutes or until just golden. Remove pie weights and cool. In a small bowl combine all ingredients except blackberries, and stir vigorously, or blend with a mixer. 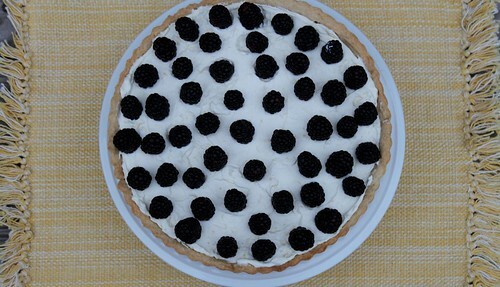 Spread mixture into cooled tart and top with blackberries immediately before serving. This entry was posted on May 3, 2011 by Spice Is Nice. It was filed under Dessert, Tarts .